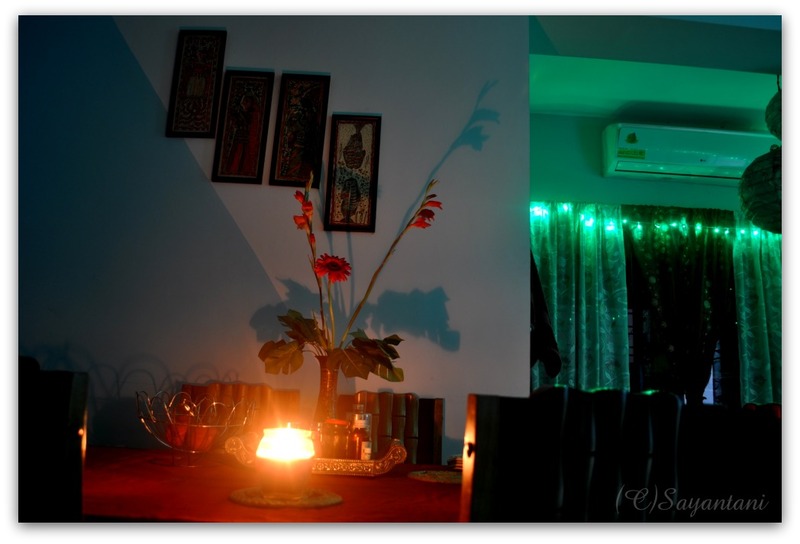 This Diwali I was extremely lazy and trust me or not dint prepare a single thing for the festival.Managed to clean the house for Durga puja and luckily my new maid is very good at keeping things as it is. Hubby would be soon off for a long abroad trip so the only thing that I find myself doing is washing, ironing and packing things for him. In between that am cooking meals in a ziffy and lazing with books in front of the TV, where its ‘Chota bheem’ playing all the time. The baby on the other hand was home as his school was closed for the week and he did whatever he wanted to with double the energy. Really Wished could have borrowed a little enthusiasm from him to cook at-least one festival item for Diwali. Rather I searched for restaurants near our locality and finally went to Rajdhani for a huge festive thali meal. The baby though was very happy. Now he is at an age when he has started understandng and enjoying things. That whole morning he kept on jumpng and screaming when the electricians fitted fairy lights around our housing. Went out with his father and Dadu with a long list of various coloured lighting crackers and candles that he needed. 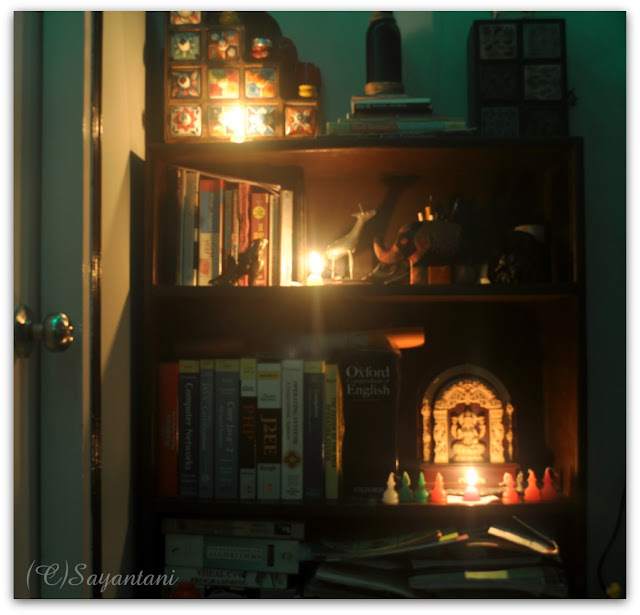 By evening he stared shouting for some red, blue, yellow tinkle tinkle lights (twinkling fairy lights) and candles around the house. He was so stubborn that finally I had to get out of my ‘lazing all day round’ mode and take him to the nearby shop. 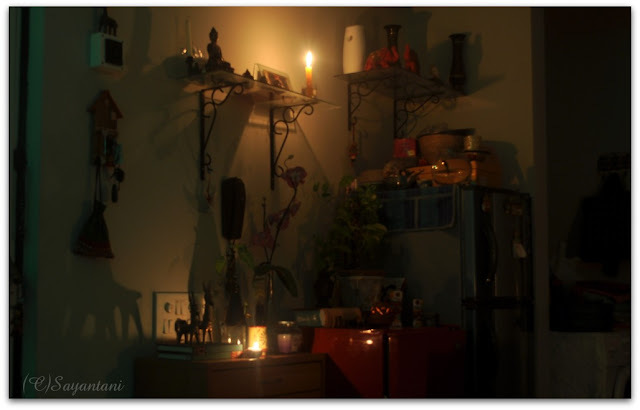 Once home he demanded to light up all the candles he bought. But am not that a bad and lazy person you see, rather am clever so even when hubby could have started complaining about no festive food at home, the next morning I prepared this typical Bengali breakfast. which is the Bengali style triangular and layered fried flat bread with potato gravy. Its like the Eastern counter part of North Indian paratha for breakfast…only difference is our parota is sinfully made with bleached white flour and loads of oil. Which is poured right from the word ‘Go’. First we add generous amount of oil as shortening then we roll and shape it with little more oil and finally oil is drizzled in an generous manner on the paratha while cooking….pretty scary. Though this paratha is a regular fix in most Bengali families for Sunday breakfast but in our 5 years of marriage this is the first time I prepared it. Any potato curry complements this dish really well to give you an instant nirvana. You can make simple alu bhaja (fried potato juliens) or alu’r bati charchari but both of us like it with some gravy. So I prepared a simple and light alu’r dom. If you like the spicier version of this curry please see this. Though all purpose flour and me are not best of friends still once in a while we love to have this. Have this on a lazy weekend when no work is scheduled. 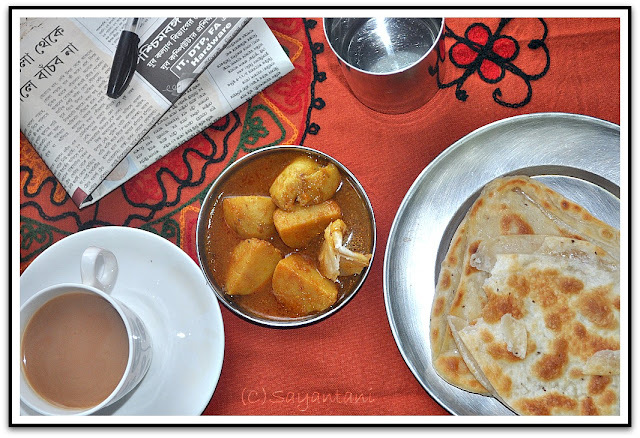 Enjoy this breakfast with your favourite newspaper and a cup of tea. for me the best part is its so heavy and filling that instantly you will like to hit the bed and doze off, skipping the lunch.No more cooking for that day. Take the flour, ajwain and salt in a big bowl or plate. Make a well at the center and add the oil in it. Rub the flour in it till it resembles breadcrumb. Gradually start adding water and mixing to see if the dough is soft and holds together. Once you achieve that, start kneading on an oiled surface or on a big plate. Knead with the heel of your palm to make the soft and springy. Smear 1 tsp oil on it and cover. Let it rest for 30 minutes before you start rolling the parathas. After that divide the dough in 10 small balls and smoothen the outer surface by rolling them between your palms. Oil your rolling pin and the surface of your rolling platform. Roll out a small circular disk. Brush the top with little oil. Fold along the diameter in half in a half circle. Again brush a few drops of oil on the top. Fold again in a triangle. Roll out the triangle and elongate to make your triangular paratha. The thickness would be similar to regular paratha. Roll the other balls in similar manner. 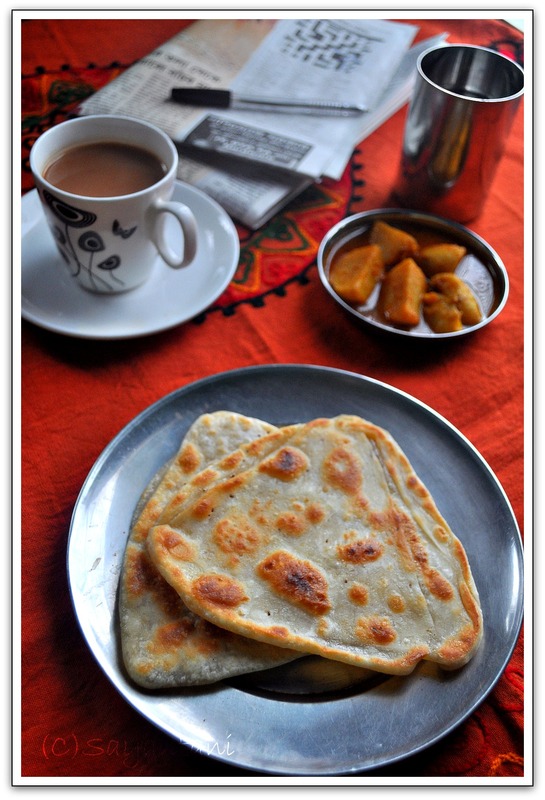 To cook the parathas, heat a griddle or a flat pan and place these parathas on top. After a minute or so you will see bubbles coming up on the surface. Flip it. Cook the other side till it turns white and small brown spots appear. Drizzle few drops of oil from the sides. Press the parathas to make sure its cooked through. Flip and repeat the process. It should take 5-6 minutes for each paratha to cook. Serve hot just out of the pan. Any potato curry pairs well with these parathas. Ash and rub the potatoes clean, cut them in quarters and boil in salted water till tender. It should be cooked but firm and should hold its shape. Peel the skin and smear it with turmeric and salt. When the potato is boiling prepare the spice paste by grinding the onion and ginger. Make a smooth paste. Heat oil in a pan and lightly fry the potatoes till golden. Take out from pan and keep aside. In the same oil add the whole cloves, cinnamon, cumin seeds and slited green chillies. When they start to splutter add the spice paste. Fry on low heat till oil start to separate at the sides. Mix turmeric, chili and coriander powder to 2 tbsp water and add to the pan. Fry for another minute or so till the raw smell is gone. Cut the tomato in quarter and add to the pan with salt. Cook till the tomatoes are cooked and oil starts oozing out at the sides. Mix in the potatoes and pour 2 cups of warm water. Check the seasoning and let it boil on medium flame. Keep cooking for 5-7 minutes or till the gravy thickens to your desired consistency. I prefer it thin. Finally add the sugar and the garam masala powder. Serve hot with parathas or luchis. sending this to 'back to the roots' hosted at the mad scientist's kitchen. Omg, seriously cant take my eyes from ur super delicious breakfast spread, beautiful dishes..
That looks awesome! Looks exactly like the ones we had in Sikkim:-) We loved it and i cant wait to try it! No wonder my Mom used to call her triangular parathas "bengali" parathas! Yum all the way. 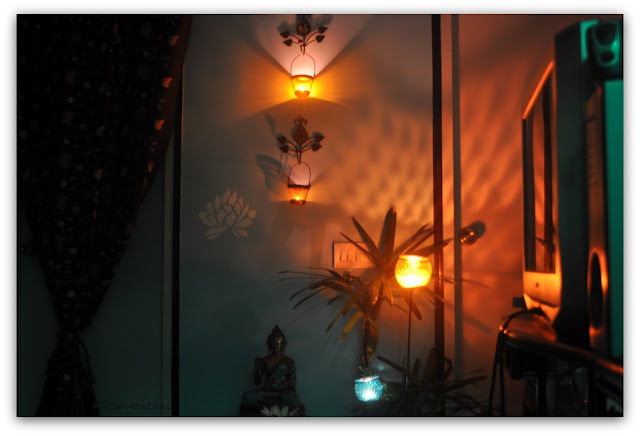 Awesome pics of the Diwali candles. Lovely pictures of the parota. Bah !darun post Sayantani.Are you also going out of town naki kolkataye thakcho. Pics of special lighting are a treat to the eyes. Great parathas as well. Great post. For me parathas always have been these triangle ones, the ones that I picture in my head when I hear 'paratha' ~ they look neat n perfect with that yummy alur dom! Tempting parathas....Loved the shape and Lovely pics of celebration..
Wow Sayantani, the pics are amazing and do recall these parathas which our neighbours(we would call them mashi and didas)prepared..loved loitering in their kitchen..reading your posts, I feel I am doing the same now:))Love your culinaries..
Darun photography ..tomar griha-sajya dekhe ami abhi-bhooto! awesome clicks .. n the parathas with chai perfect ones..
you have a lovely home. really a 'festival of lights'. the paratha looks goods. Thanks for ur wonderful comments!! My first time here...Beautiful blog!! Enjoyed reading your write ups, recipes and pics...really nice!! Perfect parathas. We too make them but usually for dinner. Your house pictures look lovely Sayantani..you have decorated your house very beautifully. 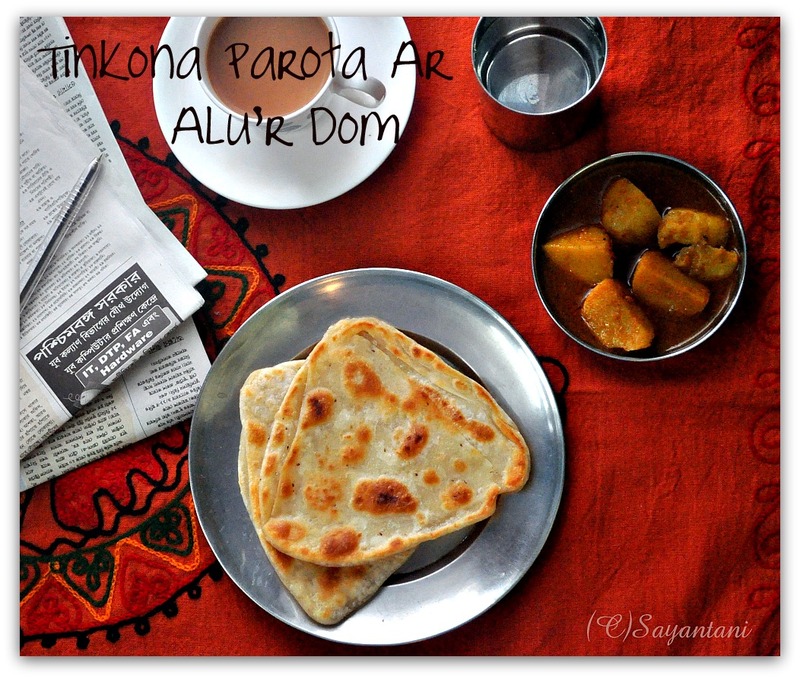 And btw these parathas are superb..and can just imagine their heavenly taste with alur dom. 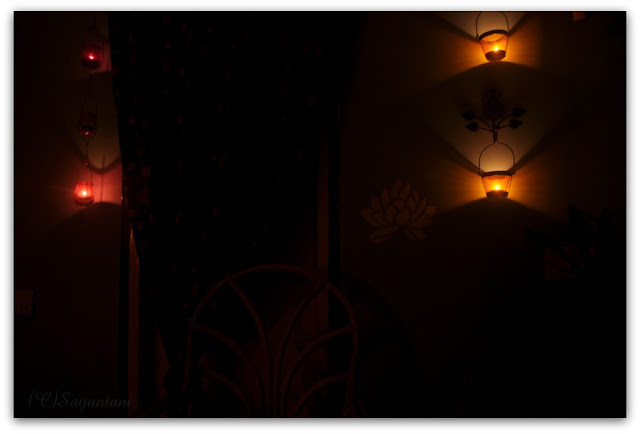 Lovely lighting in the house, love this triangle parathas with delicious looking alu dom. Tempting parota and potato curry and you have a beautifully decorated house. love the picture around your house. Beautiful! 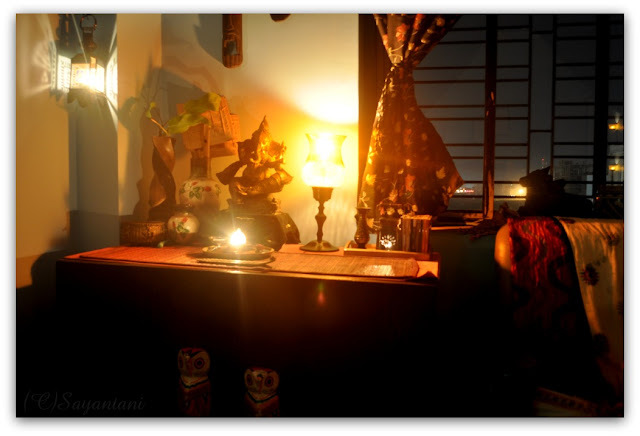 Parota ta darun, tomar table-er photo dekhe amar thakumar bari mone pore... lovely. Hi Sayantani, Loved your recipes and your writings about everyday life. I also share somewhat same experience as I am a new Mom with a toddler of 1 year 3 months. Liked some of your posts and as I am trying to learn cooking, your posts will really help me. Thanks once again. @Rituparna, thanks a bunch and your sweet comment made my day. I totally understand your situation as I was just there a few years back. am glad that I can be of some help. I ever seen this type of porota..First time im seeing this..want to try it with the Best Porota Maida..which is new to me..and thanks for sharing this recipe.